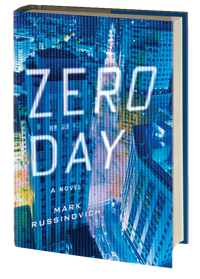 Written by Microsoft’s Mark Russinovich, Zero Day focuses on the actions of a security consultant who starts a job for a client who’s systems have been infected with unknown malware and taking out of action. With the business losing money and circling the drain whilst it’s systems are out of action the characters rapidly find themselves caught up in a plot far large than they originally signed up for. The scope of the plot starts out slow, and rapidly expands to cover a full gamut of topics, from skiddies in IRC channels and Russian hackers for hire, to corrupt government officials and Al Qaeda terrorist plots (even Bin Laden turns up in person). Dispite the Hollywood style plot elements, Russinovich keeps the technical aspects of the plot grounded in reality, even to the level that the odd code segment included can be reviewed by a (semi)proficient reader can determine the next plot arc before the characters reach the same conclusions. The overall story, and the culture the characters operate in clearly show the difference between an author with a technical background and plenty of real world experience with the subject matter, over a proficient author who has had expert assistance to get the technical aspects of a story to a plausible level, and makes a very welcome change in this growing area of fiction. 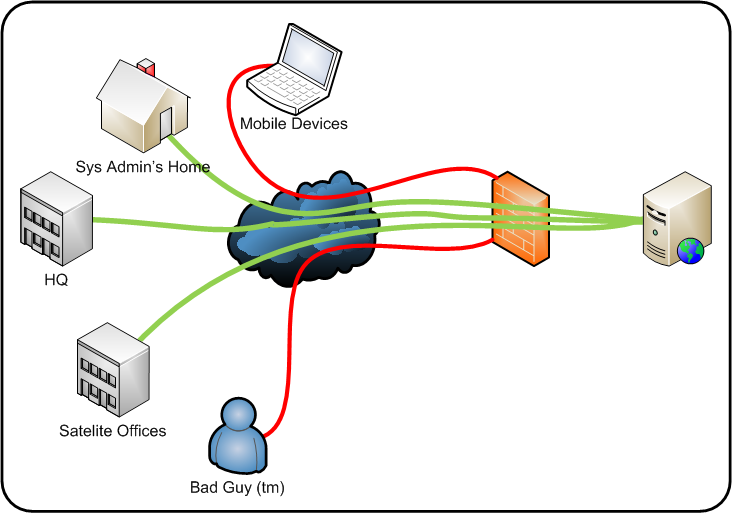 Russinovichs experience working with government and industry parties as part of the recent clampdown on botnets, the work in this area is a clear influence for the Zero Day story arc. Thankfully, Despite this being Russinovichs first novel I found it surprisingly well written, with believable characters and a plot that I became emotionally invested in (and without spoilers, cheered inside when a certain character got what I’d felt from first introduction that they deserved). If you’ve got any interest in information security, computer/network administration to just good sci-fi I’d strongly recommend picking up a copy of Zero Day, it may be shorter that I would have liked (only because I want MORE) but I thoroughly enjoyed the time spent in its created scenario. Hopefully it will serve as a warning of what could happen, rather than a premonition of an actual occurrence; unfortunately it’s likely that those with the true power to stop events similar to the books plot won’t be interested in the story summary and will miss the warning. Like most techies I get the job of fixing and maintaining relatives’ PCs. As part of this after fixing whatever is broken I have some common clean-up and install routines that I go through to both help the system run faster and to extend the period before I’m called back, and I’ve used AVG free as part of this for many years to keep costs down for my users. Again checking the details, long list of randomly named files. In the temporary folder. All ~600 took a total of less the 300MB, and the machine has more the 200GB free. Something to correct come next house cleaning session, but not really a problem. 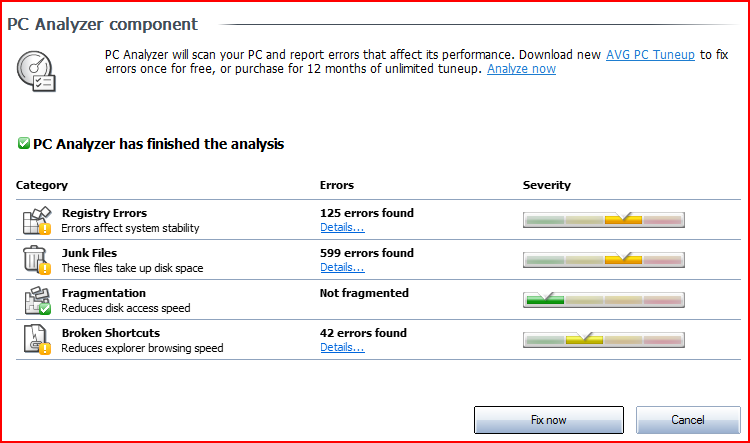 In fairness to the tool, it did come back clean and we know that fragmentation can be an issue. But that’s why every machine I’ve ever used has come with a defrag utility, as standard, for free. (OK, my BBC Micro B didn’t, but then it also had a cassette deck rather than a hard disk). Ok, so I forget a folder of shortcuts to junk that came pre-installed with the system. I’d deleted the junk, forgot the shortcuts. Thanks for the reminder, fixed. Plenty of ‘problems’ highlighted, time to run out and drop £25 for an annual subscription to the clean-up tool? Nope, ignoring the fact that many of these issues are system settings that actually aid the end user, the remaining issues won’t have any negative impact that the end-user will notice. In my own opinion, AVG is taking a leaf out of the fake AV scams and scaring non-techies into parting with their hard earned coin in a bid to keep the computer running and bank details away from the scary hackers that the nice lady on the news keeps taking about. Presenting a list of meaningless (to most) information and saying it’s bad is exactly the tactic I encountered with cold call scammers earlier in the year. As a final side note, I’ve lost two of my ‘users’ this year to AVG simply because when the AVG free license I’d installed expired, they couldn’t find a link to download the latest free version, only MANY links to the paid version. As my users are nice people (latest ‘victim’ was my grandfather), they decided themselves that it was better for them to pay the small fee than have to call me and interrupt my life. Can anyone recommend a free AV suite that doesn’t con the unwitting into unnecessary purchases to perform a cleanup that could be performed manually with around 5 minutes and half a clue? AVG Free is a great tool, and for free I shouldn’t really complain, but when the sales tactics change to make money selling things people don’t need, to those that don’t know any better? After a few weeks running my daily Kippo review script I’ve noticed that whilst I’m still mostly receiving several logins per day, it’s rare for a connection to actually interact with my emulated system. (For those new here, Kippo is a medium interaction honeypot emulating an SSH daemon, get started here). So I started trying to investigate what was causing the trend. My pass.db file contains 26 entries added by malicious ‘users’; I’m still analysing the contents in detail, but it looks like the Bad Guys(tm) are paying attention to user education 101 and using long, complex passwords. Using the password used to log into the system, I’ve had a new (to me) way to link disparate logins. For example the query below linked connections spanning two months, originating from multiple source IP address, across three different continents (according to WHOIS records). My summary from this is that Kippo is receiving a lower level of ‘interesting’ connections the longer the system is operational, as attackers login to check if they’ve maintained access to an ‘0wned’ resource, without utilising the resource. I’m intending to clear my pass.db to remove existing access; hopefully this will return to more interesting connections and I’m also curious to see if any of my current tenants return from either the same source location(s) and/or re-using passwords (and proving me wrong with previous comment about user education). Towards the end of last year I spent a few hours trialling SSH tunnels, I knew how the process worked but hadn’t had much cause to use it in anger; so my lab got some use instead, and a post was written covering the basics; SSH port forwarding 101. Since I now know how to quickly and successfully implement a tunnel, it turns out that I previously had plenty of cause to use tunnels in the past, I just didn’t know SSH tunnels were the right tool for the job. A couple of recent conversations has made me realise others don’t always know the flexibility of tunnels either so I wanted to try and describe a common scenario to highlight the usefulness of tunnels. Above is a fairly common setup. You’ve got an internal resource (for example an intranet wiki for documentation), this is in turn protected by a firewall that only allows access from trusted location. Under normal circumstances all staff can access the resource without problems, and any malicious sources (human or automated) can’t access the service. This works well, until someone needs access and they aren’t at one of the trusted locations (we’re assuming this is an unusual problem and remote access solutions aren’t in place). In a lot of environments SSH is a ‘trusted’ system management solution and is world accessible (and hopefully secured well enough to keep the barbarians from the door, but that’s for different posts). This makes an SSH connection to the server (ssh-server.domain.com), tunnelling the local HTTP service running on port 80 (127.0.0.1:80) and binds it to your machines TCP 8000 port. Now you can connect to the service by typing 127.0.0.1:8000 into a browser, thus traversing the firewall source IP restrictions. Tuesday started fine, train down the capital a chance to meet up with the London work team. So far so good, until a colleague suggested a ‘quiet’ drink after work. Ended up not being too quiet after all. With Wednesday starting off with ‘why?….’, I found some energy and headed for Security BSides London. As I’d already reconnoitered the location on Tuesday getting to the location was a breeze, only to find the door locked. Javvad Malik to the rescue, arrived at same time and managed to call one of the organisers to let us in. After brief introductions all round I met Soraya Iggy in person for the first time, absolutely nothing like I was expecting but great in every way. After receiving goodie bag (and getting repeated grief from Iggy to change into con shirt) I enjoyed some good geek chat whilst watching the venue fill. After the official opening of the event, I headed upstairs to track two, which started with Aaron Finnon discussing DNS tunneling techniques. I was looking forward to this talk as I’d got half of the information over a drink after Aaron gave his famous SSL talk when OWASP Leeds travelled to Newcastle. My main takeaway from the discussion was that with the use of some relatively simple tools it can be relatively simple to bypass most captive wireless portals if they aren’t sufficiently tying down egress traffic. First on my to-do list of ‘I wonder what happens if you try this in my environment?’. Second session was David Rook and Chris Wysopal, discussing ‘Jedi Mind’ tricks for building security programs. Having watched recordings of both presents from other events I was looking forward to getting the live experience, and neither disappointed. The presentation was great and I took a lot away for how to both discuss security issues with non-infosec people, and how to talk about the problems in business terms to get buy-in to effect real change in an organisation. I was somewhat surprised, as this started a trend of the event with my favourite presentations being non-technical in nature. Third session was one that I’d heard a few people dismiss before the event as being a bit lame. I’d already picked it out as my preferred session for this timeslot (it was a tough call, other track was Justin Clark discuss web app attacks, but the end would have over run with the next talk I wanted to see). I’m glad I didn’t let the naysayers dissuade me, Ellen Moar and Colin McLean did a great job demonstrating just how simple it is for anyone with basic computer knowledge (script kiddie) to cut and paste their way past defensive countermeasures (AV). Content wasn’t anything groundbreaking (which is why I think some weren’t keen), but I think it’s the first time I’ve actually seen someone ‘prove’ what we all accept as gospel. Scary stuff. Final session of the morning was Xavier Mertens discuss logging and event management. Not the most thrilling of topics I’ll admit, but it’s something that so few organisations seem to get right I was interested to find out if there were any ‘better’ ways that could improve the process. Not only are there apparently better ways, but apparently there are also free better ways, so I’m going to talk a closer look at OSSEC. After lunch Steve Lord provided an ‘interesting’ look into different types/levels of pentester and what it means to be in the industry. The talk received a lot of laughs, but in hindsight I wish I seen a talk with more technical content. For me, bsides was for education and networking, I’ll leave comedy to the comedians. Next talk was better, Wicked Clown, expanding on his Brucon Lightening talk showing how to break out of a restricted RDP session. This was a great presentation, and was another attack to add to my ‘what if’ to-do list. More importantly he also provided a simple fix to prevent the attack vector, considering it’s a single checkbox, and the workaround breaks how most would ‘expect’ the service to behave I’ll echo his confusion as to why Microsoft don’t have the checkbox ticked by default. Perhaps secure out of the box is too much to ask? David Rook took to the stage again, this time alone and discussing static code analysis with Agnitio. 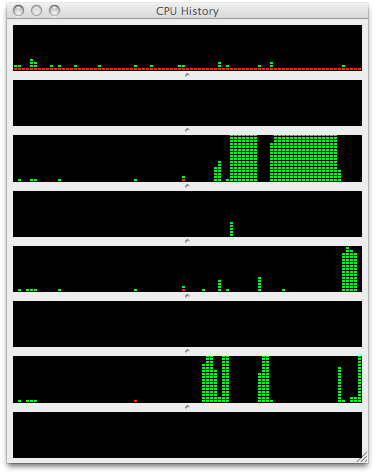 I’d taken a look at Agnitio since David released it, but as I’m not much of a dev (see the utilities I release for proof…) haven’t been able to try it in anger. If you’re interested, the talk slides are available on the Security Ninja blog. If the tool can reach the stated end of it’s road map of being the ‘Burp Suite of static analysis’ then it should be a fantastic tool. Next talk I saw was Manuel demo (reverse~re)engineering of DRM within Android applications. I found the talk fascinating, mostly by how quick Manuel was able to put the pieces of the puzzle together and bypass the protections put in place to do exactly what he was attempting. Whilst the presentation was good, it was one of those where you felt your comparative IQ drop as you see black magic being wielded at the keyboard before your eyes. we don’t have a solution for the iPhone, as it’s a secure platform why bother? I did take advantage of the Syngress stand’s discounts and filled out my to read pile. (Ninja Hacking, Seven Deadliest USB Attacks, Cybercrime and Espionage and Digital Triage Forensics). Although I didn’t take as much advantage as the gentleman in front of me in the queue, who literally bought one copy of every book on display; totalling over £450. The trip ended with a bottle of lager sat outside the British Museum in some glorious weather (which unfortunately didn’t follow me back home). I don’t want to name names, as undoubtably I’ll forget someone, but my most common phrase this week has been ‘Good to finally be able to put a face to the twitter handle’, it really was good to meet people I’ve spoken to online for a while, and to make some new contacts as well. Looking forward to the next time we’re able to meet up. P.S. sorry for formatting towards the end, seems to be a strange limit with the number of paragraphs wordpress will accept per post. Will try to correct in due course. a fast password cracker, currently available for many flavors of Unix, Windows, DOS, BeOS, and OpenVMS. Its primary purpose is to detect weak Unix passwords. Besides several crypt(3) password hash types most commonly found on various Unix systems, supported out of the box are Windows LM hashes, plus many more with contributed patches. John is commonly available for most ‘nix systems under their package management systems. However, I’d strongly recommend compiling from source to ensure John takes full advantage of more powerful hardware capabilities than the ‘generic’ build. Compiling from source is straightforward, and I’m yet to encounter any difficulties. The additional time spent with manual compilation definitely pays for itself in the long run, read the INSTALL file for instructions. Unfortunately, john doesn’t currently take advantage of multi-core systems and only uses a single core (see below). There are methods for sharing the processing load between multiple instances of john, or even across john instances running on multiple systems, but that’s a topic for another day. John comes packaged with a default password list, containing a little over 3000 entries, and several methods for generating hybrid guesses including appending numbers to entry or performing ‘l33t’ replacements. Rules for hybrid attacks can found (and edited) in the john.conf file. Even without tweaking, john is still effective at cracking hashes as the below shows. John has a lot of additional functionality; go install, tweak and crack (only with permission, obviously). As a security guy I find my paranoia levels are slightly high than most, a little something inside me picks up on things that general users miss that indicate that something isn’t right. This morning was no exception…. These are email alerts sent by the monitoring system Nagios, running within InfoSanity’ networks. The NRPE-check_users parameters have been modified from the Debian defaults to be more paranoid; triggering a warning alert with a single user logged into the server, and go critical if more than one. So; from this, someone is logged into the web server, and it isn’t me. Feeling the onrush of panic, I log into server and chuck commands at a shell to see who is violating my system. Last, who and /var/log/auth all showed that no one had accessed the server at the time of my alerts. Everything good? Not if your paranoid, starting to smell a rootkit causing the system to lie to me. There are a couple of anti-rootkit utilities that have served me well in the past, chkrootkit and rkhunter. Wondering which one to run? As we’ve already discovered I’m paranoid, answer was both. And both gave a clean bill of health to the system. Now I’m really getting paranoid. Anyone spotted it? 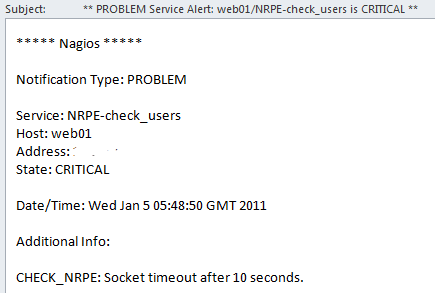 Yep, the service alert went critical when the check’s socket timed out (network issue), and then dropped to warning showing a single user when the connectivity returned; which was correct, I’d forgotten to log out of the console on my last VMWare connection. Stepping down from high alert…..
Don’t respond to system alerts before finishing first coffee of the morning. The events weren’t a total loss though, besides getting my heart-rate up and blood flowing, it was a good(ish) refresher for incident response (can’t beat the adrenaline rush of responding to an incident, real or imagined) and rkhunter uncovered a potential weakness in the server configuration which has since been corrected (no, I’m not telling you what).